Globe Video Films, railwayana, cabsides, totems, shed plates, nameplates. We offer advertising space on our website to sellers of Railwayana. Only genuine (not replica) items are eligible and a charge 5% commission on sale price is made for this service once an item is sold. There is no addition of either buyers premium or VAT to the price shown. Nor is there any charge for storage, or further administration charge, because we simply connect seller with prospective buyer. This should benefit both buyers and sellers immensly because of the combined effects of buyers & sellers premium that is charged at most railwayana auctions. A saving to sellers of approx £166 per £1000 is likely by using our services. There is also a significant saving to buyers. Once interest is declared in an item, we will put the prospective buyer in touch with sellers and leave them to discuss the fine detail. A contact telephone number will be required to pass onto buyers (land line or mobile). We will need the sellers name and address for invoicing commission which can be paid by cheque/card/paypal etc. Remember - all we charge is 5% commission to the seller of the item, once it has been sold. Should you wish us to consider advertising your item please email us with details in the first instance. Items submitted should have a minimum sale price of £200. There is no upper limit. Original RAILWAY TOTEM from DIDCOT station. Fully flanged and in A1 condition. For larger resolution photos to show the quality of this item please email or call. Inspection can be arranged by appointment with the vendor. Original RAILWAY TOTEM from HORNCHURCH station. Half flanged and in unusually good condition for a totem from this station. Original RAILWAY TOTEM from GLAZEBROOK station. Fully flanged and in quite good condition, but has a crease repair on the right hand flange. Half flanged and in very good condition. 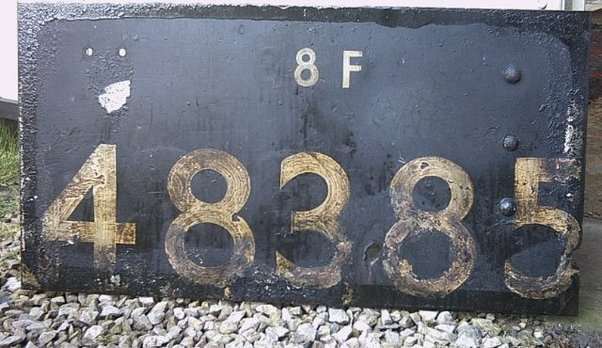 A totallly genuine steam flamecut numberpanel,drivers side i understand, from an ex LMS 8F 48385. This plate was rescued from Butegigs cutting yard in the late 1960's. The rear angles have been painstakingly removed, leaving the back still encrusted with caked soot. The face is as ex-loco as can be expected & still retains its grimy as running condition. Of-note..this plate has approx 3 sets of old numbers under the old BR black paintwork & Old LMS white larger numbers can be seen to break out in spots...this is not paint blobs. The 8f logo repeats itself in 3 places also.........indicating that when "shopped" only had a brief lick of paint with no rubbing down. Traces of LMS maroon paint to lower edges.See the original Oily hand brush strokes when numbered...not transfers. Outer edge (only) sealed with light varnish to stop further flaking. Paint face burnt as seen slight damage to lower numbers, but because they are applied in different locations, look & present nicelly.Not sure why they burnt these bolts out, as the cutters left all the seat structure on. Rare item...I've never heard of any other 8f's being saved. Loco used to be 15A Wellingborough loco. Size approx 32" x 22" flat & ready to wall mount. Must be seen pic does not do it justice. 85013 flamecut numberpanel ex class 85 "roarer" AC Electric. With all the heavy old iron angle removed from rear & guiloteened cut to wall mount. Front remaning totally ex-loco / scrapyard condition. Sealed varnish edge to protect from paint flaking. Of note most of the class 85 loco plates were scrapped & melted down only a few survive, this is due to their weight. This is a 10mm thk plate; with rear as left to underseal. One of the 85's not destinned to go to 85/ 1 . Withdrawn early 90's. 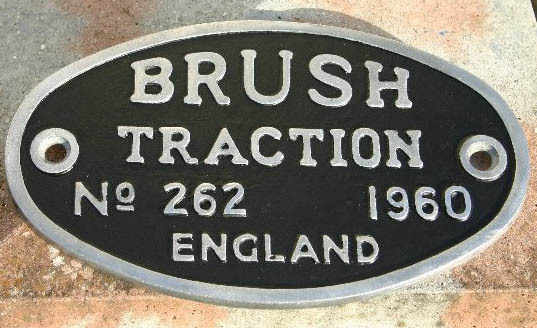 Size approx 27" X 13"
GWR cast iron cabside 3805 in as believed ex-loco condition & ex Kiddlington years ago. Last shed 86A Newport Ebbw. Withdrawn 1964. Can be secure delivery at extra cost. £850. OR - will swap for contractor tank cabside 3407 or 3408 in similar condition. Signal box Key token alloy Machynlleth to Dovey Junction, on ex Cambrian lines down Barmouth way. Condition ex Signal box used old & as original. LANCASTRIA original stencilled Artwork from English Electric Class 40 diesel 40023 as purchased from Crewe Works circa 1984. This has had its rear angles gently removed whilst leaving the face totally ex-loco, even the bolts are in the original locations. Its ready to wall mount, unfortunatelly has the top bolt section missing but does not detract from its originality. Rare single coloured Lacastria name & the best of the 2 plates available. Stencilled by Longsight & Tinsley fitters in the late 70's.& very collectable. Size approx 30" X 17"
GWR cast iron cabside 3730 in believed totally ex-loco condition, ex auction house years ago. Last shed 88E Abercynon, shed only had a few pannier tanks .Withdrawn 1964. Can be secure delivery at extra cost. £500. GWR brass CABSIDE NUMBERPLATE No 4940 Hall Class 4-6-0 "Ludford Hall", first allocated to Taunton in July 1929. The loco was also based at Plymouth Laira, Chester, Weymouth, Bristol St Phillips Marsh, Penzance, St. Blazey sheds during it's life. Withdrawn in November 1959 and scrapped at Swindon Works January 1960. The first Hall Class locomotive to be withdrawn. Please telephone or email to purchase or for more information. Delivery or collection by arrangement. Carried by split headcode class 37 No. 37111/37326 Glengarnock, complete with an EWS certificate of Authenticity. Research shows that 37111 had its original "Loch Eil Outward Bound" nameplates removed July 1986. 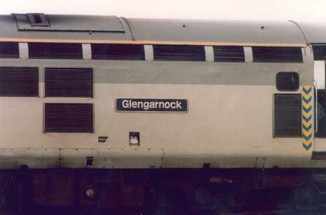 The engine was renumbered 37326 on the 23/07/1986 and it was renamed Glengarnock at Motherwell on the same day. On 09/07/1989 the engine was renumbered back to 37111. The engine finally went into store on 01/04/1996 and was cut up on 06/07/2003 at EMR Kingsbury. The plate is as purchsed from EWS and is totally unrestored as shown in the photos. It is in good condition and was not bent or damaged during removal. Nameplates from class 37's are not common, especially those from the split headcode ones. Half flanged in good rich dark E.R. blue. Slight mottling on the wings. A few edge chips as expected, most of which only touch the white border. Please contact for larger image if required. Please telephone or email to purchase or for more information. Delivery or collection by arrangement. Original and untouched RAILWAY TOTEM from CHRISTCHURCH station, Hampshire. without a blemish of any significance. A very rarely seen totem. A RAILWAY TOTEM from CARSTAIRS station, fully flanged and in totally original condition. A rare Light blue West Coast main line very rarely seen at auction. Restored ORIGINAL WORKSPLATE from Class 31 Diesel D5662 (later 31235). Loco introduced in October 1960 and can still be seen today at the North Norfolk Railway. Worksplate, The English Electric Co Ltd., No 3233/D758 dated 1962. Ex Class 37 number 37104, originally D6804. New to traffic in January 1963 and allocated to Darnall. After extensive service throughout the UK, it was finally scrapped in July 1999 and cut up by Raxstar at Immingham MPD in April 2000. Loco allocated Darnall 1963, Gateshead 1971, Tinsley 1974, Thornaby 1976, Healy Mills 1979, Immingham 1984.